Dredd: Brilliant. There's laugh-out-loud shopping and clever social commentary (it's said that the tipping point for autonomous cars comes when their accident stats are better than humans. Makes sense; after all, something similiar has already happened with bank managers giving out loans. Interesting to see Dredd implying the same with the robot judges ... Logan's love of stats doesn't bode well ...). Skip Tracer: Yawn. Even turning-up the colour saturation can't save this. Brink: Good. I wasn't much of a fan but it's winning me over slowly. 3rillers: Eh? That didn't make much sense to me; will have to re-read the full story to see what I've missed. Jaegir: Hmm. Still a bit too wordy for my liking but Simon Coleby's artwork is stunning. Wot the fork? What button must I push to get my prog on a Friday?! You do realise that this is completely sacrilegious don't you? Ah, that explains the toasty-warm feeling I've had this evening. And the faint whiff of beefy crisps. Yes I can see the concept behind the cover. I do not think this is a cover to attract potential customers. Hopefully the content inside makes up for this one. This gets it for me. I'm loathed to just whine about an unsuccessful cover and this one does need to be applauded for its very bold and striking concept. However the execution and particularly colouring is lamentable. Which is odd when you see some of the wonderful work Raid71 has on their website. I'd like to see them get another go as I think 90% of the time they'd produce a stonker. I do wonder why editorial let this run as it is, but art is so subjective what the heck do I know! Anyway to other matters and content. You'd be forgiven for thinking its as you where really. Dredd and Brink are off the scales good. Dredd jawing with barely masked contempt with Harvey but still jawing is a delight. So much with so little is done here. Brink is a complete shift change from the stunning 'finale' of last issue but its clear that this is far from just an epilogue and there are big things still to be done. All be it returning its Brinks understated genius in doing it! Skipperty has a pretty solid action episode. Its just I'm disconnected with the story again so it does matter and I have to say for me the 3riller has a shocker of an ending. Who knew chopping off someones leg would be so easy come, easy go! The big change is of course Jaegir in for ... well more Brink... so lets set aside the more Brink as more Brink is always going to beat 98% of thrills EXCEPT the great think is the more Brink we got last week now seems very deliberately more Brink foe the specific of the events we got. 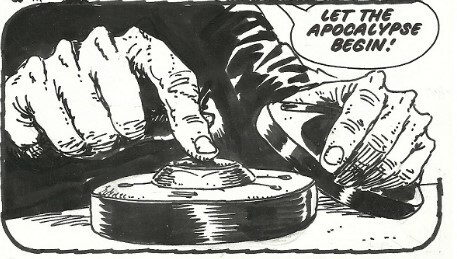 I wonder if the original plan was for this to land in the X-Mas prog - who know - Tharg does of course but not me for sure. Anyway what's important is Jaegir has a FANTASTIC grab you by the throat opening. Its done that to me before and let me go, but sometimes it keeps hold, what's important is its got a good chance so this is a win. A very good win at that. So step up in the Prog and given we get that with less Brink that's quite a thing to say! 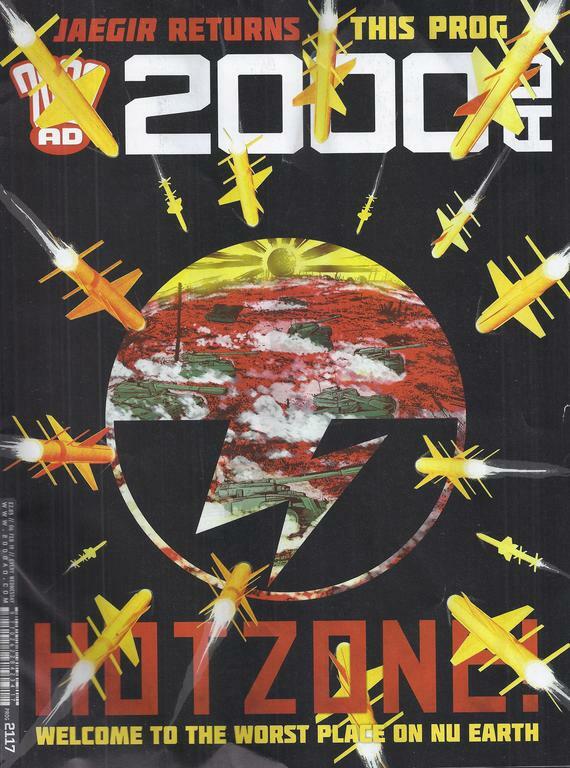 I love the use of black, which is unusual and dramatic, I like the incoming missiles, I just think that there needs to be something striking and identifiable in the centre of the image rather than red/yellow clouds. Yes the cover isn't up to much, has a rather rushed, uninspired feel to it. Dredd is just great, script and art in perfect harmony. Love the art in Jaegir and she's a very engaging character with good action to get stuck into. Overall a decent prog, thanks Tharg.